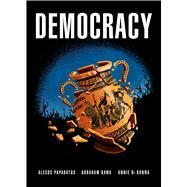 Democracy opens in 490 B.C., with Athens at war. The hero of the story, Leander, is trying to rouse his comrades for the morrow's battle against a far mightier enemy, and begins to recount his own life, having borne direct witness to the evils of the old tyrannical regimes and to the emergence of a new political system. The tale that emerges is one of daring, danger, and big ideas, of the death of the gods and the tortuous birth of democracy. We see that democracy originated through a combination of chance and historical contingency--but also through the cunning, courage, and willful action of a group of remarkably talented and driven individuals. Alecos Papadatos and Annie DiDonna, artists behind the international phenomenon Logicomix, together with writer Abraham Kawa, deliver a graphic novel bursting with extraordinary characters and vibrant color, one that also offers fresh insight into how this greatest of civic inventions came to be. Alecos Papadatos has worked as a film animator, director, and storyboarder, and creates cover art for books and periodicals. He spent five years drawing Logicomix, which became an international phenomenon. He lives in Athens, Greece. Abraham Kawa is a writer and cultural studies theorist in Greece. His academic work focuses on graphic novels, cinema, and genre fiction. Annie Di Donna has been an animator on many international productions. She works as an art director and colorist for graphic novels.